INDIANAPOLIS, Ind. (August 25, 2016) – With five angel investing chapters across Indiana and another set to launch, nearly 90 angel investors, and close to 20 portfolio companies, VisionTech Partners/VisionTech Angels have emerged as one of the Midwest’s most active investors in early growth startup companies. 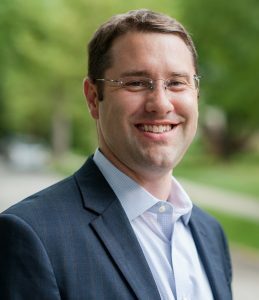 To take advantage of the “startup boom” in Indiana and across the Midwest, VisionTech has hired its first executive director, Benjamin (Ben) Pidgeon, a 15-year veteran of the banking industry and current president of the Venture Club of Indiana. Prior to joining VisionTech, Pidgeon served as vice president and private banker at Stock Yards Bank and Trust in Indianapolis. He has also worked with MainSource Bank and M&I Bank/BMO Financial, both in Indianapolis; Bank One in Greenwood, and Oak Street Mortgage in Carmel. In addition to serving as president, Pidgeon serves on the Board of Directors of the Venture Club of Indiana; has served as president and treasurer of the Institute of Management Accountants, Indianapolis Chapter; and is former member of the Woodruff Place Foundation Board of Directors. A native of West Lafayette, Indiana, Pidgeon earned a Bachelor’s of Science in Economics from Purdue University and a Master’s of Business Administration from the IU Kelley School of Business. He holds Six Sigma Greenbelt Certification.